Traveling with bags can be a challenge in any environment. An experienced traveler knows the safer locations to rest and can sense when a location is not ideal. At times we all end up in the “not ideal” situation. I have ended up overnight in New York’s Penn Station waiting for a train and I have overnighted in airports that I felt unsafe in. I have also had moments were I was sure someone was trying to set me up to rob me in places where I normally felt very safe and comfortable. While a location and its environment can remain stable, the change of people in that environment can alter its sense of security very quickly. For many quick situations I use three or four small “Sentry Locks” with a short cable to secure my bags to an immovable object. 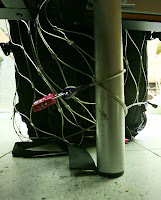 While the lock & cable combination works often, there are times I want a nearly impenetrable security system to protect my bags and my equipment. When I want significant security of my bags, such as when sleeping in airports, I use the PacSafe line of Anti-Theft Backpack & Bag Protectors. The PacSafe Anti-Theft Backpack & Bag Protector is an ingenious, compact, light weight, way to not only prevent a thief from entering your bags or leaving with your bags, but it is an outstanding on-sight deterrent. PacSafe’s design uses its “eXomesh” system to create a complete barrier between the outside world and your bag, while also securing your bags to an immovable object with an integrated locking cable. This design blocks nearly any chance a thief could have to unzip your bag and remove items through the eXomesh exterior, especially if you lock the zippers within the Anti-Theft Backpack & Bag Protector and lock the zipper lock to the eXomesh it’s self. Using the Anti-Theft Protector is simple, you open the case, you slide out the Anti-Theft Protector, you slide it over your bag, secure it tightly, use the integrated cable to secure your bag to any immovable object. The sheer sight of the Anti-Theft Protector should deter nearly any thief. While you should never get up and walk away from your bags in an airport or a train station, having your bags enveloped in this simple item should allow you to put your head back and sleep soundly knowing that your bags next to you are not going anywhere. When staying in a hotel you can also use the Backpack & Bag Protector to secure your camera equipment, computer or other valuables. What I like to do is place anything of value in a single bag, often a North Face Offsite bag, secure the bag inside the Backpack & Bag Protector, lock the bag zippers shut, place part of the eXomesh inside the lock it’s self, then lock the Backpack & Bag Protector to the bed frame or the desk. By securing my bag in this manner, unless someone enters my room with a bolt cutter, I can go out and do my job without worrying about what I left behind in my room. For those of you trekking through a high-risk area, you can also place the Anti-Theft Protector around your bag, loop your shoulder straps through it, and wear your bag while it is inside this protection system. I don’t personally travel this way, but I have tried it out, and if you are wearing a shirt you’d never feel a difference between carrying your backpack without the Backpack & Bag Protector. The PacSafe Anti-Theft Backpack & Bag Protectors come in a variety of sizes to accommodate everything from a smaller backpack to a large duffle bag. The lightweight compact design of he Anti-Theft Protectors makes them simple to use and extremely easy to travel with. With basic packing skills these Anti-Theft Protectors, made from PacSafe’s eXomesh, take up virtually no space in your bag. For me this item is a must have for all travelers. Below are four photos of my PacSafe 55 with the Mountainsmith Parallax (it’s a very tight fit) and with my North Face Surge Backpack. The PacSafe 55 and North Face Surge bag show my bag secured to a bench I was napping on at Amsterdam-Schiphol Int’l Airport (AMS) two nights ago.